Having been gifted with a few hours in central London, I decided to visit the National Portrait Gallery to see the “Queens in Waiting” exhibition. I knew that it was not a large display, so I was not unduly surprised to find that it comprised of just a single room on the 2nd floor, next to the galleries displaying Regency portraits. The exhibition reflects on the lives of two young women born to be queen: Princess Charlotte of Wales and her cousin, Princess Victoria. Rather more of the display is given over to the little known Princess Charlotte than to her famous cousin. They both led a restricted life, each found happiness in marriage with a German prince, but whereas Princess Victoria became one of England’s greatest monarchs, Princess Charlotte never became queen. As the only legitimate child of George IV, Charlotte was heir to the throne from her birth. Tragically, she died in childbirth in 1817 and the public grief at her death has been likened to that evoked by the death of Diana, Princess of Wales, in 1997. As well as engravings of both her parents, George IV and Princess Caroline of Brunswick, there is a charming portrait of Princess Charlotte, aged about three, with her mother. The stipple engraving is dated 1799 and is by Francesco Bartolozzi after Richard Cosway. This is balanced by engravings of Princess Victoria’s parents, the Duke and Duchess of Kent, and a portrait from 1823 of the young Victoria, aged about four, with her mother, a line engraving by William Skelton after Sir William Beechey.In this picture, the young Princess is seen clutching a miniature portrait of her deceased father, thus asserting her claim to the throne in what appears to be a harmless family portrait. I particularly liked the unfinished watercolours of Prince Leopold (1816) and Princess Charlotte (1815) by Thomas Heaphy. These watercolours were only partly completed and the contrast between the painted and unpainted sections made the finished sections seem particularly vivid. Several pictures in the exhibition celebrate the love that both Princesses found in their marriages to their German husbands. Princess Charlotte and Prince Leopold are shown at Drury Lane Theatre in a coloured engraving of 1818 made by William Thomas Fry after George Dawe; this is the picture used to advertise the exhibition. There is also an engraving of their wedding: “The Prince and Princess Coburg retiring from the Altar after the Marriage Ceremony”. 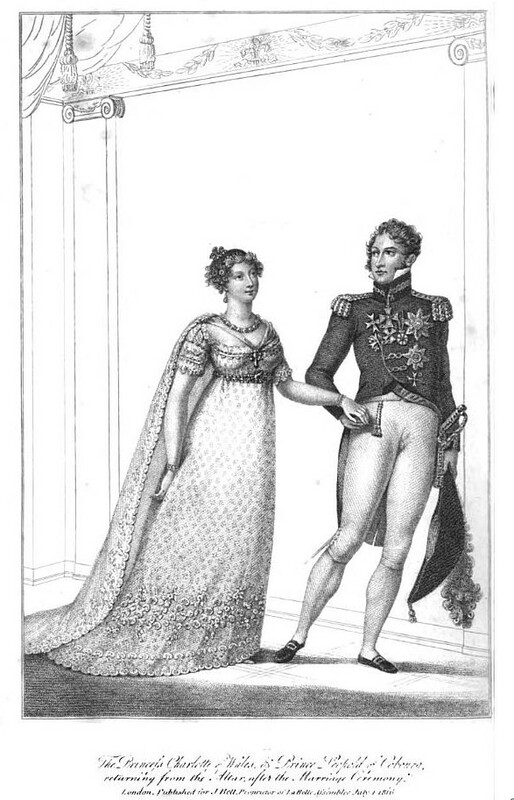 This was published in 1818 by J Booth and is very similar to an earlier engraving published in La Belle Assemblée in 1816 which is shown here. Princess Victoria and Prince Albert are shown in a mezzotint of their wedding day, “The Bridal Morn” by Samuel William Reynolds I after Frederick William Lock published in 1844. Princess Charlotte was seen as a symbol of hope for a nation whose monarchy had been overshadowed by madness and profligacy in the hands of a succession of sickly old men. This hope was often depicted by white roses that appear in several of the portraits, including an 1816 watercolour by Richard Woodman, a stipple engraving by Robert Cooper after John Masey Wright published posthumously and the picture of Princess Charlotte and Prince Leopold at the theatre mentioned above. 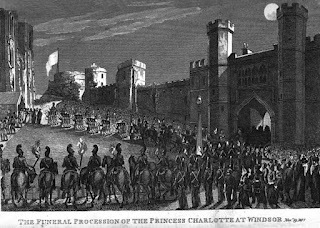 I found the most moving picture in the exhibition was that of the funeral procession of “the much beloved and regretted Princess Charlotte of Wales and Saxe-Coburg” by Thomas Sutherland after Richard Barrett Davis, published in 1818. The picture shows the torchlight funeral procession to St George’s Chapel on the evening of 19 November 1817, an event which was attended by massive crowds. An alternative representation of the funeral procession is shown here. With the birth of Queen Victoria, the hope for the nation that had died with Princess Charlotte was reborn. It is significant that the rose was once again incorporated into the portrait of the young Princess Victoria by James Bromley after Sir George Hayter, in 1833, symbolising this hope. The final exhibit, that I almost missed, is just outside the room. This is a coloured wax relief of Princess Charlotte at the theatre by Samuel Percy in 1814. The Princess is shown wearing a crimson robe around half her shoulders and the detail is exquisite. I enjoyed the exhibition though I was disappointed it was not bigger. However, its position next to the Regency galleries meant there was plenty more for a Regency historian to see. There are lots of Regency portraits – George IV, William IV, Mrs Fitzherbert, Charles Fox, Walter Scott, Percy Shelley and Sarah Siddons to name but a few. I was delighted to be able to view the original portrait of Jane Austen by her sister, Cassandra; it is much smaller than I imagined, being about the size of a paperback book. One other picture is worth a particular mention: “The Three Witches from Macbeth” by Daniel Gardner, 1775. This gouache and chalk painting depicts Elizabeth Lamb, Viscountess Melbourne, Georgiana, Duchess of Devonshire and Anne Seymour Damer as the three witches. Underneath the picture is the following wording: “Accepted in lieu of tax by HM Government and allocated to the Gallery in 2011”! Some of the portraits on display can be seen on the National Portrait Gallery website. The exhibition is open until 14 October 2012.